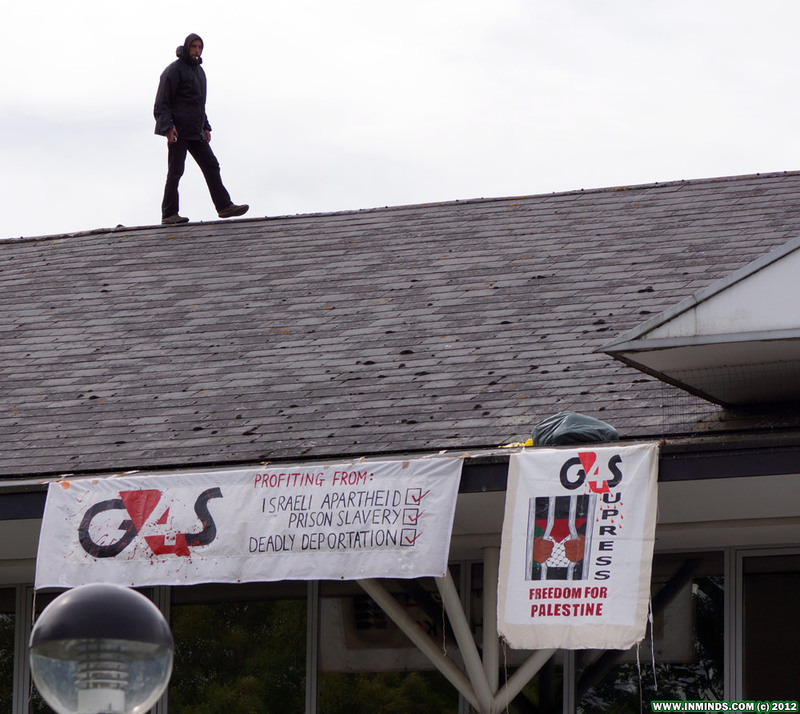 Activists carried out a rooftop occupation at the headquarters of security multinational G4S near Crawley, West Sussex, in protest at what they claim are “illegal and criminal activities” in both the UK and Palestine/Israel. Earlier today two activists climbed on top of the multistory building and secured themselves in place using superglue and bike locks. Another dozen protesters surrounded the building on the ground, shouting slogans and holding anti-G4S placards. political prisoners from occupied territory are transferred in violation of the Geneva Conventions, tortured and subjected to arbitrary detention. For more photos and information on the protest go to the Indymedia UK website. This entry was posted in Action, BDS, Uncategorized and tagged Occupation, Palestine. Bookmark the permalink.